New smaller individually wrapped bar size available for trade customers. 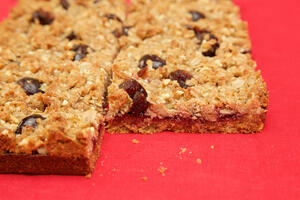 Our delicious new free-from Cherry Crumble Bar traybake is perfect for the food service sector. We've passed SALSA with flying colours for the tenth year running! 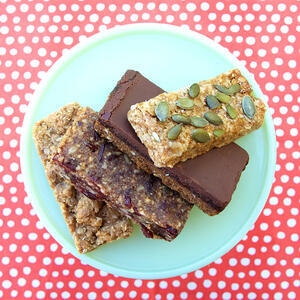 Our artisan bakery has created a range of innovative free from traybakes exclusively for food wholesaler Bidfood. 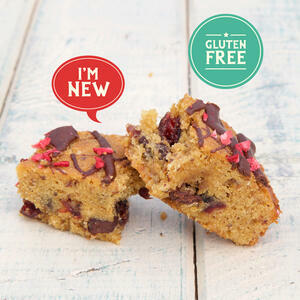 Our New Generation range of cakes offer more free from options. 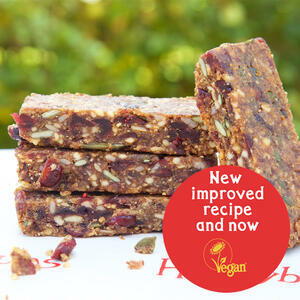 Our Fruity Nut Bar is now vegan! 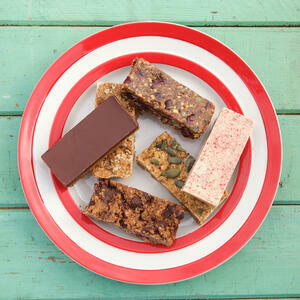 We've given our fruity Nut Bar a bit of a revamp! Two delicious new Classic cakes coming soon! We've been hard at work in our test kitchen and are delighted with the results. We're making some important changes to our allergen information. 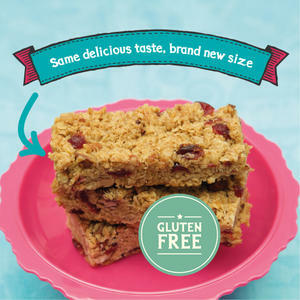 We've expanded our range of free-from cakes with the launch of two new oaty flapjacks. Have you seen our gorgeous new packaging? 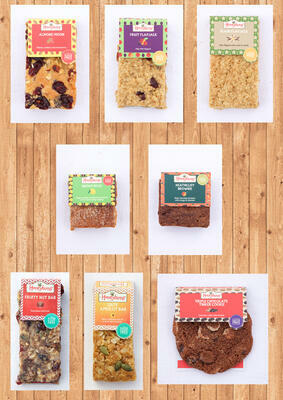 Over the past year we've been working with our designer to refresh all our cake packaging. 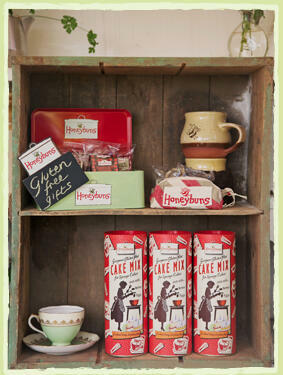 We now have all bases of indulgence covered with our two cake ranges: Classic and New Generation. This delicious and decadent new generation of cakes addresses the increasing demand for gluten free and low in refined sugar cakes. Where possible they are dairy free and vegan too. Find us at Lunch! where we'll be unveiling our new generation of gluten free cakes and packaging designs. We've been hard at work developing a delicious new range of cakes that are vegetarian, gluten free and wherever possible dairy free too. The newest addition to this next generation of cakes is the Squillionaire, a date version of our top selling Chocolate Caramel Shortbread. 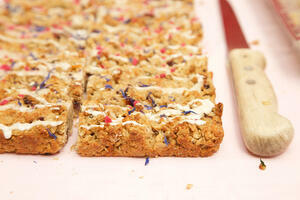 We pride ourselves on our innovative cakes, and our new Fruity Nut Bar is no exception. 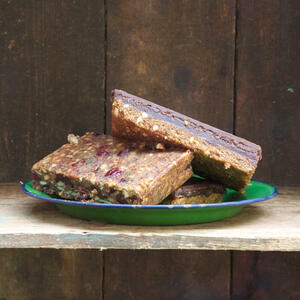 Packed with nuts, fruit and seeds, the Fruity Nut Bar tastes like a cake, not a health bar. 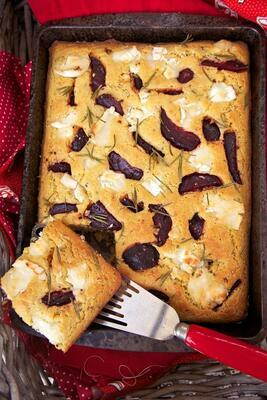 Not only is it gluten free but it is dairy free too, and very low in refined sugar. How do we develop our recipes? Initially the recipes were inspired by Emma's grandmother and mother who were streets ahead of their time in using unusual ingredients and always focusing on flavour and texture. We had an unannounced Local authority Environmental Health inspection in August. The sugar debate continues and we’re super conscious of needing to review our Honeybuns range and get refined sugar levels down across the board. 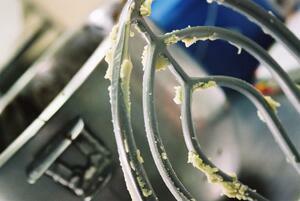 We’re achieving this by doing the obvious and reducing the levels of sugar in each recipe across the range. We like to feel that we've set new standards in the realm of off-the-shelf home baking mixes with our Sponge Cake Mix and Cornbread Mix, and we hope to add to the range later this year. Our customers, both online and in our on-site café, let us know they wanted to create gorgeous tasting treats at home.These gourmet mixes are brilliant must-haves in the cupboard for when you need a quick but high-end treat. Suitable for coeliacs, they have received rave reviews from our consumer testing panel and café customers. Are you ready for the new allergen regulations? We've been poring over the new Food Information for Consumers Regulation or FIR to see how this affects us as manufacturers, retailers and consumers.There are several new regulations from nutritional claims to country of origin. The change in allergenic ingredient regulation and, specifically "gluten free" is the subject of this blog.